The carrot can trace its ancestry back thousands of years, originally having been cultivated in central Asian and Middle Eastern countries, along with parts of Europe. These original carrots looked different from those that we are accustomed to today, featuring red, purple, and yellow coloring rather than the bright orange that we've become accustomed to in U.S. supermarkets. Carrots became widely cultivated in Europe during the 15th and 16th centuries and were first brought over to North America during this same general time period. In today's commercial marketplace, China currently produces about one-third of all carrots bought and sold worldwide. Russia is the second largest carrot producer, with the U.S. following a close third. Many European countries produce substantial amounts of carrots (over 400,000 metric tons) and Turkey, Mexico, India, Indonesia, Australia and Canada are also important countries in the worldwide production of carrots. Within the U.S., about 12,000 acres of carrots for processing are planted each year, resulting in about 320,000 tons of carrots. Over 80% of all fresh market carrot production in the U.S. comes from California, with Michigan and Texas emerging as the next two largest fresh production states. Currently,U.S. adults average about 12 pounds of carrot intake each year. Approximately 9 pounds are being consumed in fresh form, with the other 3 pounds are being consumed in frozen or canned products. This amount translates into approximately 1 cup of carrots each week in fresh, frozen, or canned form. How to select and store: Carrot roots should be firm, smooth, relatively straight and bright in color. The deeper the orange-color, the more beta-carotene is present in the carrot. Avoid carrots that are excessively cracked or forked as well as those that are limp or rubbery. In addition, if the carrots do not have their tops attached, look at the stem end and ensure that it is not darkly colored as this is also a sign of age. If the green tops are attached, they should be brightly colored, feathery and not wilted. Since the sugars are concentrated in the carrots' core, generally those with larger diameters will have a larger core and therefore be sweeter. Carrots are hardy vegetables that will keep longer than many others if stored properly. The trick to preserving the freshness of carrot roots is to minimize the amount of moisture they lose. To do this, make sure to store them in the coolest part of the refrigerator in a plastic bag or wrapped in a paper towel, which will reduce the amount of condensation that is able to form. They should be able to keep fresh for about two weeks. Research has shown that the especially valuable (all-E)-beta-carotene isomer is well-retained in carrots if stored properly. Carrots should also be stored away from apples, pears, potatoes and other fruits and vegetables that produce ethylene gas since it will cause them to become bitter. I love soup. Soup is versatile one pot wonders. The foundation of any soup is the stock. You can cook soup in 30 minutes or less, but it will taste like you cooked the soup all day. In a large pot, add ground beef. Season ground beef with salt, pepper and Worcestershire sauce. Breaking ground beef up as it cooks, cook until no longer pink. Add beef broth and remaining ingredients. Bring to boil, reduce heat, simmer until potatoes are tender, about 25 minutes. Taste and season, if desired. Enjoy! I love carrots and I love the education you give. I always learn something new. This soup sounds so heart and delicious too. I'm on a major soup kick! This looks like a perfect early-fall dinner! This looks so delicious!!! I love the flavors you used in this soup, yum! The first time we saw purple carrots Adam about had a cow he was so delighted and amazed! We bought them just to look at them. We love your food history it's so much fun to learn all these new things about stuff we take so much for granted. Your soup's a nice addition to the fall menu! I like the way you write the history behind the recipe or the vegetables. I am not a beef person butyour soup looks great with all the vegetables added to it and not to forget the chipotle pepper sauce. I eat carrots because I have horrible eyes and for some reason I think that the more carrots I eat the more my vision will improve...at least they won't get any worst. It's soooo cold out here tonight - this totally fits the bill! 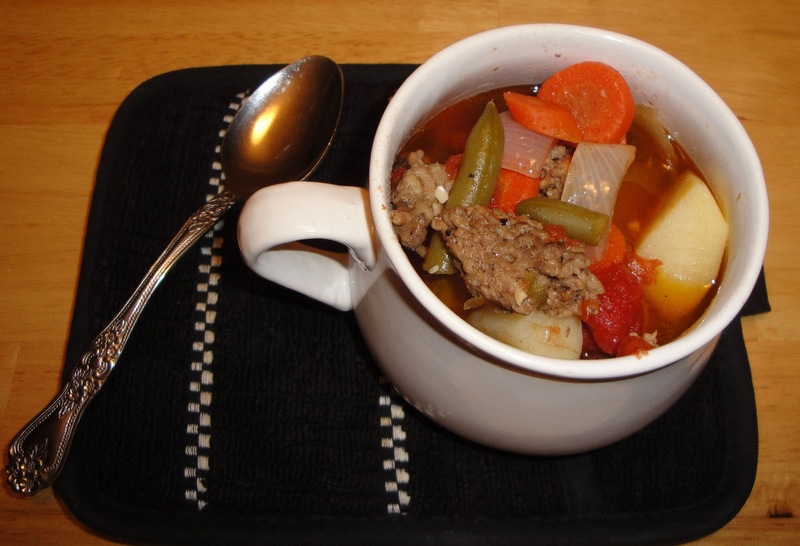 This soup looks hearty and delicious, Christine! It's not cold here. At my home it's 77 degrees. Yummy,,,I love that kind of soup ! Who knew we ate that many carrots?! Great recipe, this is a wonderful soup. I love the history on this one. I had no idea who produced the most carrots. I would have guessed us Canucks. I know I certainly eat my weight in them yearly. Lol! I like the tips on how to choose carrots and adding it into this stew is so great. My family eats carrots like they are going out of style. I am pretty sure they eat more than 12 pounds in a year! Great soup. Your soup looks so good. We definitely have soup weather now! We love carrots, especially the baby carrots, which are a great snack. Between my hubby and I we eat about 1 lb a week. I'm on a soup kick, and this just made real hungry... sounds delicious! Christine, there was a time when I could get purple carrots wehn we lived in France! They were not only beautiful but large and flavorful! Love the recipe! Thank you for your kind comment and thanks for the invite. I will check it out. This is a hearty recipe and great for a blustery day like today. I never knew carrots came in such pretty colors. I'd love to see a purple or red one. I love the different carrots that are just going mainstream these days. The soup is perfect for the coming chill! Thank you for the lesson on carrots! Who knew? Bet the chipotle gives this sew great kick! You always post such interesting information. I learn something new every time I visit. The soup looks hearty and delicious too. Well, that is interesting about carrots! Nice, hearty soup, Christine. Have a good week! I missed a lot of posts from friday, so I am glad you re-sent this one. I am stocking up on soup recipes so I have added yours to them. Southwestern flavor always gets my vote and this soup does look hearty. Yum! This looks wonderful! It has the perfect amount of heat too. Perfect for the chili weather that is approaching for us. The soup sounds really amazing! It's soup season and I was looking to add a new soup Idea. Love that there are a lot of ingredients that my family just loves. The soup sounds absolutely delicious! I had no idea that carrots could become bitter from storing them with other fruits/veggies. Thanks for all the great info! I love all the veggies in this!